Six hybrids between ledums and lepidote rhododendrons (subgenus Rhododendron ) are described in the order they were produced, viz. : Ledum palustre ssp. decumbens x Rhododendron lapponicum , L. p. ssp. diversipilosum x R. russatum , L. p. ssp. decumbens x R. hippophaeoides , L. p. ssp. diversipilosum x R. fastigiatum , L. glandulosum x R. fastigiatum and R. ferrugineum x L. groenlandicum . Four of the five rhododendrons involved belong to subsection Lapponica and one ( R. ferrugineum ) to subsection Rhododendron . The first of these hybrids was produced in order to confirm that R. vanhoeffeni - found in 1893 in West Greenland by Dr. E. Vanhffen and there recently rediscovered - is a natural hybrid between L. p. ssp. decumbens and R. lapponicum . The hybrid between L. p. ssp. diversipilosum and R. russatum is interesting because it proved to be fertile, a fact that suggests a close relationship between ledums and rhododendrons and supports the view that Ledum should be included in genus Rhododendron . 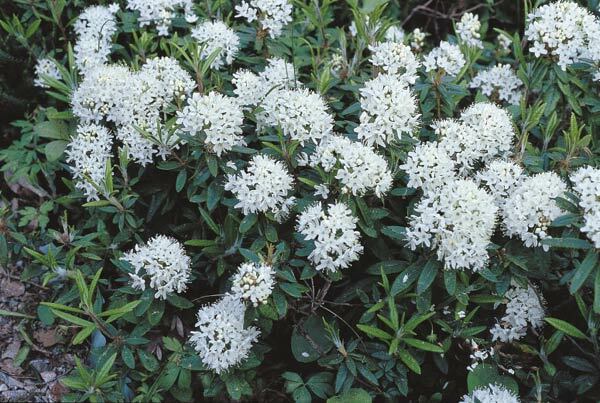 The ledum taxa are described as small, evergreen shrubs, upright or decumbent, with alternate, short-stalked aromatic leaves and many small, white flowers in terminal umbellate corymbs. Unlike the flowers of other rhododendrons, the flowers of ledums have separate petals after opening. The pistil is short (4-6 mm), and shorter than the stamens. The capsules of rhododendrons split from the tip, but those of ledums differ by splitting from the base upwards. It has been pointed out, however, that the petals of the ledums are united at the base at the bud stage and that capsules opening from the base have been observed in rhododendrons, as well as capsules opening from the tip in ledums (8, 18). The leaves of the ledums are linear, elliptic, lanceolate or oblong with revolute margins. The ledums have multicellular, glandular peltate scales. These have not always been recognized as scales, however, because they are rimless, i.e., they lack the radiating fringe-cells that the scales of most lepidote rhododendrons have. The inflorescence of the ledum taxa may vary regarding the size and number of flowers, but these variations are small and hardly significant. The vegetative parts, on the other hand, have many characters of importance for classification, a fact that was pointed out by Harmaja (8). Such characters are, for instance, the type and number of hairs on leaves, petioles and shoots. In Atlas of North European Vascular Plants , which is based on the work by Eric Hultn and completed and published after his death (in 1981) by Magnus Fries (14), two species of Ledum are distinguished, viz., L. palustre and L. glandulosum . According to this classification, the Ledum palustre complex comprises subspecies palustre in Europe and Siberia, ssp. decumbens in Eurasia, N. America and Greenland, ssp. diversipilosum in N.E. Asia and ssp. groenlandicum in N. America and Greenland. Previously, a similar classification was used by Hara (6) and subsequently Small and Catling (26) have used it as late as in 2000. In contrast, Russian taxonomists have distinguished between at least seven species of Ledum. In N. America groenlandicum is traditionally regarded as a separate species. Thus, the Ledum taxonomy is a typical example of the controversy between "splitters" and "lumpers," i.e., between taxonomists who tend to treat closely related taxa within a genus as different species and those who prefer to regard these taxa as subspecies or varieties of one and the same species. In a cladistic study based on morphological evidence, Kron & Judd (18) concluded that Ledum should be included in genus Rhododendron as a subsection in section Rhododendron of subgenus Rhododendron . The conclusion that Ledum belongs to genus Rhododendron has been supported by studies using DNA sequences to estimate evolutionary relationships (4, 5, 17, 19). R. tomentosum Harmaja: ( Ledum palustre ). The ranking of R. subarcticum has been reduced to a subspecies of R. tomentosum by G. Wallace (28) in agreement with the ranking proposed by Hultn (11). It should be mentioned that E. Hultn and A. E. Porsild had a life-long controversy regarding the classification of L. decumbens and L. groenlandicum . Hultn always treated these taxa as subspecies of L. palustre (11, 12, 13), whereas Porsild regarded them as distinct species: Ledum decumbens (Ait.) Lodd. and Ledum groenlandicum Oeder (22, 23, 24). I am inclined to support Porsild's and Harmaja's classification. To the differences between L. palustre and L. p. decumbens listed by M. P. & A. E. Porsild (24) and Harmaja (8), the composition of the essential oil can be added. In L. decumbens it is rather similar to that of L. groenlandicum with germacrone as its main constituent, whereas in L. palustre the main constituents are myrcene, palustrol and ledol (25). Furthermore, the two taxa have different numbers of chromosomes: palustre 2n=52, decumbens 2n=26 (20). Regarding L. p. decumbens it should be mentioned that both M. P. Porsild (24) and Harmaja (8) have pointed out that there is no conclusive evidence supporting the idea that this taxon occurs in N. Europe. The plants observed were almost certainly small specimens of L. palustre . I started writing this article with the intention of using the new rhododendron names of the ledums, but soon realized that I could not do it consistently. The old ledum names had to be used when studies before 1990 were quoted or described. To avoid confusion, I decided to use the old ledum names throughout. (See Table 1). Table 1. Ledums and lepidote rhododendrons (Subgenus Rhododendron ) used in the crossing experiments described in this article. R. neoglandulosum Harmaja Ledum L. glandulosum Nutt. Before Ledum was included in the genus Rhododendron , a hybrid between a ledum and a rhododendron was intergeneric and named x Ledodendron . In the horticultural literature there are few examples of such crosses being successful. Therefore, it was always close to a sensation when the production of a "ledodendron" was reported. In 1965 Brooks & Son advertised in the Quarterly Bulletin of the American Rhododendron Society a successful cross between Ledum glandulosum and the elepidote rhododendron hybrid 'Elisabeth'. The hybrid was given the name x Ledodendron 'Brilliant'. Subsequently, however, some serious doubts have been expressed about 'Brilliant' being a true intergeneric hybrid. In 1974 Donald Paden (21) reported that he had succeeded in producing "ledodendron"s by pollinating L. groenlandicum with pollen from either R. 'Elisabeth' or from R. yakushimanum 'Mist Maiden'. The fact that I have been unable to find any information about the fate of these "ledodendron"s suggests that they were no successes. 'Arctic Tern', an attractive and deservedly popular garden plant, is almost certainly a true ledodendron. In contrast to the hybrids previously mentioned, 'Arctic Tern' is the result of a spontaneous cross, the seed parent being R. trichostomum , a lepidote belonging to section Pogonanthum . 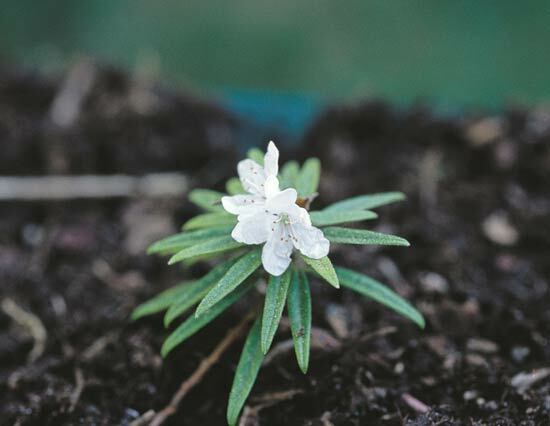 H. L. Larson of Tacoma, Washington, U.S.A., found in the offspring of his pink flowering R. trichostomum a plant with white flowers, which in addition to the flower colour resembled the ledums in other respects as well. At first it was assumed to be a mutation form of R. trichostomum , but Peter Cox from Glendoick gardens in Scotland was able to establish that it is a hybrid between R. trichostomum and a ledum, probably L. glandulosum or L. columbianum , both of which grow wild in the area where Larson's garden is situated. In the 1993 spring issue of this journal I reported on the successful production of a hybrid between Ledum palustre ssp. decumbens and R. lapponicum (15), but more about this cross later. There is a difference between the first two and the last two of the crosses mentioned, which is likely to be significant: in the first two cases the rhododendron parent is elepidote, whereas in the last two lepidote rhododendrons are involved. Crosses between elepidote and lepidote rhododendrons hardly succeed and the ledums are lepidote. 1. L. palustre ssp. decumbens x R. lapponicum . A. The natural hybrid x Ledodendron vanhoeffeni . The hybrid was discovered in 1893 by Dr. Emil Vanhffen from Kiel. A pressed specimen, the type, was described in 1899 by Abromeit (1) as a new species of Rhododendron , R. vanhoeffeni , although he didn't exclude the possibility of the plant being a hybrid between Ledum decumbens and R. lapponicum . For nearly a century this was the only known finding of R. vanhoeffeni , but in June 1986 Lars Geil found in a locality a few kilometers east of the airport at Kangerlussuaq (Sndre Strmfjord) a plant that was confirmed to be identical with R. vanhoeffeni by Dr. Bent Fredskild. Subsequently, several more specimens have been found, both at Kangerlussuaq and at other places in West Greenland. The rediscovery of R. vanhoeffeni and subsequent findings and observations have been described by Dalgaard and Fredskild (2). The authors conclude that R. vanhoeffeni is a hybrid between Ledum palustre ssp. decumbens and R. lapponicum . Since they follow the classical classification of Ledum as a separate genus, vanhoeffeni is an intergeneric hybrid, a Ledodendron to which they gave the new name combination x Ledodendron vanhoeffeni (Abromeit) Dalgaard & Fredskild. But if Ledum is included in genus Rhododendron , vanhoeffeni is a hybrid between the rhododendron taxa R. tomentosum ssp. subarcticum and R. lapponicum and should be called R. x vanhoeffeni . Rhododendron vanhoeffeni has been described in detail by Abromeit (1), a description to which Dalgaard & Fredskild (2) have added further observations. Fig. 1. The natural hybrid x Ledodendron vanhoeffeni (Abromeit) Dalgaard & Fredskild. Kangerlussuaq (Sndre Strmfjord), West Greenland, June 1993. In connection with his description of the natural hybrid, Abromeit pointed out that the ultimate proof of R. vanhoeffeni being a hybrid between Ledum p. ssp. decumbens and R. lapponicum would be obtained by making a detailed comparison between the natural hybrid and a hybrid produced artificially by crossing the two putative parental species. In the spring 1991, we had in our garden plants with floral buds of both parental species, and my wife, Irma, and I decided to carry out the crossing suggested by Abromeit. Some of the parental species were derived from seed collected by me on Tardoki Jani in Sichote-Alin, Russian Far East, whereas others were of Canadian origin. Unfortunately, we did not in these first crossing experiments have access to material from Greenland. 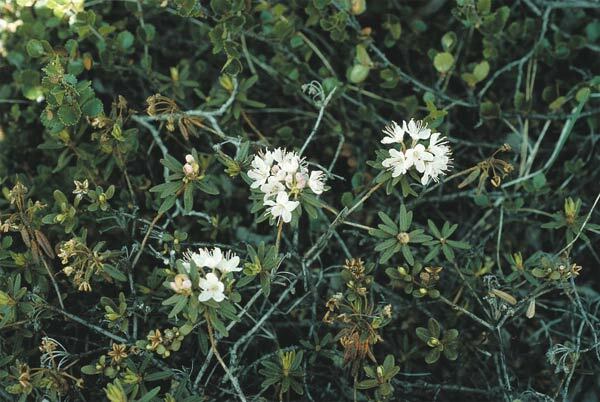 In June 1992, however, we visited Kangerlussuaq and collected both parental species with floral buds. After this first visit, we went to Kangerlussuaq two more times (the summers 1993 and 1994) to study the natural hybrid. During these visits, we also took some cuttings of the natural hybrid in order to be able to compare it with the artificial hybrids produced by us. and Rhododendron lapponicum . Parents of Canadian origin. in Stockholm. Parents from West Greenland. The artificial hybrids originating from Canada and West Greenland have pink or almost white flowers with a diameter of 1.0-1.2 cm. The 10 stamens have brownish red anthers. Like the natural hybrid, the artificial ones are both seed and pollen sterile. On the whole, the artificial hybrids, particularly those with parents from West Greenland, are so similar to the natural hybrid that they cannot be told apart. Thus, our crossing experiments confirm the conclusion of Dalgaard and Fredskild (2) that vanhoeffeni is a hybrid between Ledum palustre ssp. decumbens x R. lapponicum . 2. Ledum palustre ssp. diversipilosum x R. russatum . Encouraged by our successful crosses between L. p. decumbens and R. lapponicum , we decided to attempt crosses between ledums and other representatives of subsection Lapponica . We chose L. p. diversipilosum (9) which then was flowering abundantly in our garden and R. russatum which at the same time was flowering in the Genetic Garden in Uppsala. For practical reasons L. p. diversipilosum was used as the seed parent and R. russatum as donor of pollen, but our experiences from previous crosses between ledum and rhododendron also influenced our decision. Ledum palustre ssp. diversipilosum is one of the broad-leaved ledums of the Far East. The classification and nomenclature of these taxa is particularly complicated and controversial. The various authors have often given different names and ranking to the same taxon and the same name to different taxa. A character frequently used to distinguish the broad-leaved ledums of the Far East is the type and amount of hairiness on the underside of the leaves. As the name implies, diversipilosum varies considerably in hairiness (diversi = of varying, pilosum = hairiness). In our diversipilosum - derived from seed obtained from the Botanic Garden in Sapporo, Hokkaido, Japan - the white tomentum on the underside of the leaves is covered by long rusty hairs. The leaves are on the average 4.2 cm long and 1.3 cm wide. The inflorescences contain a large number of flowers with a diameter of 1.5-2 cm, whereas the flowers of other ledums are only 1.0-1.4 cm in diameter. The 10 stamens are longer than the pistil. A further characteristic of diversipilosum is the type of its essential oil. Like the leaves of most ledums, those of diversipilosum are aromatically fragrant when touched. The fragrance is, however, different from and stronger than that of most other ledums. The only ledum I know of which has the same type of fragrance is Ledum macrophyllum , suggesting that the composition of the essential oil of these taxa is more or less the same. Unfortunately, I have not been able to find any information on the chemical composition of these essential oils. In my opinion, L. p. diversipilosum and L. macrophyllum resemble each other in so many respects that they probably are very closely related. The crosses between L. p. diversipilosum and R. russatum were carried out in May 1994, and in late August-early September the capsules were harvested. The seed, sown in late autumn, sprouted well. The hybrid plants are in most respects intermediate between their parents. This applies to the size and shape of the leaves as well as to the hairiness and the size and number of scales on leaves, petioles and shoots. The lanceolate or elliptic leaves are about 3 cm long and 1 cm wide. The underside is covered by a thin white tomentum, partly hiding the scales. The scales of R. russatum , like those of most lepidote rhododendrons, have radiating fringe-cells. Some of the scales of the hybrid are partly equipped with such cells, but the majority are rimless as in Ledum . The vitality of the majority of the hybrid plants was rather low, however, and their root system was poorly developed. During the summer 1996, the most vigorous of the hybrids formed two floral buds, which opened in June 1997. Each of the two inflorescences carried five pale violet flowers (RHS Colour Chart 1995: Violet Group 84C). The petals were joined at the base. The 10 stamens and the pistil were of the same length and appeared normal. Plenty of seed was obtained by selfing, the seed capsules splitting from the base as those of the ledums. The seed sprouted well when sown and we could conclude that a fertile hybrid had been produced by crossing L. p. diversipilosum with R. russatum . When the cross was repeated, however, using R. russatum 'Mary-borough' as pollen donor, the resulting hybrids were sterile. Reciprocal crosses were made this time, but they were successful only when diversipilosum was the seed parent. Fig. 5. The fertile hybrid between L. palustre ssp. diversipilosum and R. russatum . Photo by Bengt A. Kihlman Fig. 6. L. palustre ssp. diversipilosum x R. russatum . A cutting taken from the plant shown in Fig. 5, the photo being taken in May 2002. As expected, the plants of the F2-generation varied considerably with regard to size and appearance. Among them were both quite vigorous, ledum like plants with large leaves and compact, small-leaved plants that resembled more their R. russatum grandfather. Unfortunately, the root system of the last type of plant was poorly developed and most of the plants died during their first summer. The surviving plants of the F2-generation resemble their ledum grandmother, except that they have larger flowers (2.0-2.6 cm in diameter compared to 1.5-2.0 cm in L. p. diversipilosum ) that are frequently pink before opening. The flowers further differ from those of the ledums by having pistil and stamens of equal length. The scales are intermediate between those of L. p. diversipilosum and R. russatum . The leaves, petioles and shoots are hairy. All the surviving plants of the F2-generation are seed fertile, but only a few produce pollen. Since we managed to cross two plants, we now also have a F3-generation. The great majority of the seed capsules of the F2-hybrids split from the base. Like the plants of F2-generation, those of the F3-generation vary considerably regarding size and appearance, but on the whole, the F3-hybrids are smaller and more compact. The flowers, often pinkish in colour, are about the same size as the flowers of the F2-generation. 3. Crosses between R. hippophaeoides and L. palustre ssp. decumbens . The first cross was made in 1999 with L. p. decumbens as seed parent. Unfortunately, the reciprocal cross was not made at that time. Last year (2003), however, the reciprocal cross was made and the swelling ovaries of all the five pollinated flowers suggested that the pollinations had resulted in fertilization. By the end of August five seed capsules had formed. Two of these were harvested although still not quite ripe. The capsules did not open spontaneously, but when carefully forced open, they were found to contain a fair amount of seeds. Twenty four of these were sown in Petri dishes on moist filter paper. Five days later several of the seeds had germinated, and twelve days after sowing all 24 had, thereby providing conclusive evidence that crosses between R. hippophaeoides and L. p. ssp. decumbens can succeed also when hippophaeoides is used as seed parent. The cross with L. p. decumbens as receiver of pollen resulted in plenty of seed that sprouted well. The viability of the progeny was poor, however, the majority of the seedlings being yellow or yellow-green variegated. For crosses between species such a result has been reported when plastid DNA is inherited from both parents but when the plastids of only one of the parents can develop into chloroplasts in the presence of the hybrid nucleus (16). We kept the green seedlings, eight in all, although not even those were particularly vigorous. Since the autumn 2000, they have been kept outdoors in a cold frame. Today, only five are left. 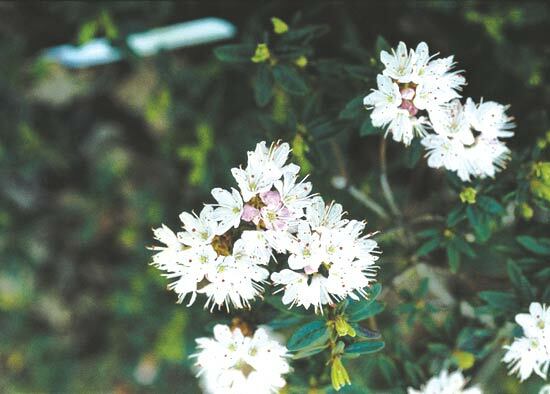 In June 2000 one of the plants flowered with two white flowers, intermediate in size between the flowers of its parents (see Figure 7). The petals were joined at the base. The 10 stamens had brown anthers and the pistil a brown stigma. Last summer (2003) another of the hybrids flowered. The only inflorescence contained five white flowers, about 1.4 cm in diameter. The number of stamens was 10 and the anthers and stigma brownish in colour. The pistil was longer than the stamens. Fig. 7. L. palustre ssp. decumbens x R. hippophaeoides . The linear elliptic leaves of the hybrids are 1.4-2.7 cm long and 0.3-0.6 cm wide. They have a large number of small, rimless scales (particularly on the underside), and hairs on the margins. 4. Crosses between R. fastigiatum and ledum taxa. These were all one-way crosses, since R. fastigiatum is not hardy in Uppsala (at least not in our garden). At the end of May 2000 we collected pollen of R. fastigiatum in the Botanic Garden in Stockholm (Bergianska) and the pollen was used to pollinate L. p. ssp. diversipilosum , L. groenlandicum , L. glandulosum and L. p. ssp. decumbens . The plants of L. groenlandicum used in the crossings described in this article are derived from seed collected at Churchill, MB, Canada. They are 50-70 cm tall shrubs with elliptic or narrowly oblong leaves that are on an average 3-6 cm long and 1.3 cm wide. The flowers are about 1.4 cm in diameter and have 5-9 stamens. This provenance of L. groenlandicum is completely hardy in Uppsala. The plants of L. glandulosum used are derived from seed obtained from the Scottish Rock Garden Club and collected wild in Oregon, U.S.A. Among the ledums, L. glandulosum is easily distinguished because of its usually flat leaves without hairs. Since the leaf margins are not revolute, the shape of the leaves is broadly elliptic or oval. The length of the leaves in our material varies between 1.5 and 5.1 cm and the width between 0.6 and 2.3 cm, the average length/width ratio being 2.1 cm. Ledum glandulosum is not completely hardy in Uppsala. All crosses resulted in seed that was sown at the end of October. The seed germinated rather poorly, however, and seedlings were obtained only in the crosses with L. p. diversipilosum and L. glandulosum . The viability of most seedlings was low and at the end of the summer 2001 we were left with two hybrids of the cross with L. p. diversipilosum and six of the cross with L. glandulosum . During the winter the hybrids were kept outdoors in a cold frame. Of the parents only L. p. diversipilosum is reasonably hardy in our garden in Uppsala. The winter 2002-2003 proved to be an unusually hard one and in spite of the protection, all hybrid plants were more or less badly damaged. Rather surprisingly, however, all of them survived in spite of the damage. As has been the case with most hybrids between ledums and rhododendrons, the hybrids are almost intermediate between their parents. The elliptic leaves of the hybrids with L. p. diversipilosum as seed parent are 2-3 cm long and 0.6-0.7 cm wide and have on both sides plenty of scales (intermediate in size between those of the parents) and very few hairs. Some of the scales are partly equipped with radiating fringe cells. The hybrid is rather small and compact in habit and, on the whole, a quite nice looking plant. Unfortunately, nothing can be said about its flowers as yet. Apparently, the hybrid is not completely hardy in Uppsala. Of the six hybrids with L. glandulosum as seed parent one flowered last summer The only inflorescence contained seven flowers, very pale violet in colour. The petals were joined at the base. The pistil was longer than the 10 stamens. Anthers and stigma were brownish in colour. The small elliptic leaves are 2.3-2.7 cm long and 0.4-1.1 cm wide. On their underside they have scales with radiating fringe cells; hairs are lacking. The hybrid is probably not hardy in Uppsala. 5. R. ferrugineum x L. groenlandicum . During the last years important information on evolutionary relationships has been obtained by using DNA sequence data. Two such studies, using the internal transcribed spacer (ITS) regions of nuclear ribosomal DNA have pointed to a close relationship between R. ferrugineum and the two ledums L. groenlandicum and L. palustre (3, 4). If this were true a cross between R. ferrugineum and a ledum should stand a good chance of being successful. The summer 2002 R. ferrugineum flowered in our garden in the beginning of June. By that time the ledum taxa had already ceased flowering, but we had kept some pollen of L. groenlandicum in the ice box. The pollination of R. ferrugineum was repeated a couple of times, and in the beginning of July the swelling of the ovaries suggested that fertilization had occurred. This was quite exciting for two reasons: it was the first time we had succeeded in crossing a ledum with a rhododendron that did not belong to subsection Lapponica and also the first time a cross had succeeded when the ledum was not a recipient of pollen. The seed capsules resulting from the cross were harvested at the end of August and seed was sown in the beginning of November. The seeds began to sprout 8-10 days later, but since the germination was poor, more seeds were sown at the end of November. The seedlings resulting from both sowings were not only few, but they also grew very slowly. In fact, most of them developed into abnormal dwarfs. There was, however, one notable exception. It grew not only faster than the rest of the seedlings of the cross, but as shown in Figure 8, even faster than the R. ferrugineum controls. when the plants were six months old. 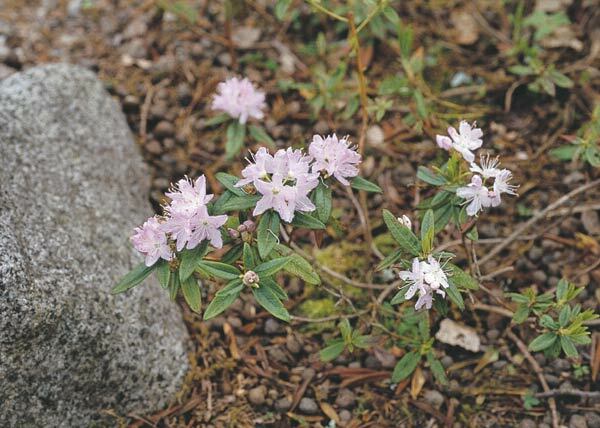 Again like most first-generation hybrids between ledums and rhododendrons, the hybrid between R. ferrugineum and L. groenlandicum is in most respects intermediate between its parents. The leaves are narrowly oblong or linear oval, 3.3-4.6 cm long and 1.0-1.2 cm wide, with scales on both sides and hairs on the slightly revolute margins and also sparsely on the upper side. The scales are intermediate in size between those of the parental taxa and are partly equipped with radiating fringe-cells. I expect the hybrid to have inherited the hardiness of its parents, which both are completely hardy in Uppsala. Time will show what kind of flowers the hybrid has. It is well known that the hardiness of a plant is not determined only by the lowest temperature it can tolerate; many other factors are of importance as well. One such factor is the length of time the plant is exposed to low temperature and another is the presence or absence of a protective cover of snow. It should be borne in mind that when I am reporting on the hardiness of the hybrids between ledums and rhododendrons, it is the hardiness in our garden in Uppsala that I am talking about. In Uppsala periods with temperatures around 20C are to be expected from November to March. This would not be so bad if we had snow at the same time but, unfortunately, the periods of cold weather frequently coincide with periods without snow. As a result, the ground can freeze to a depth of 40 cm or more. From February onwards, frequent sunny periods do not improve the situation. An example: L. p. diversipilosum and R. russatum are in their native habitats in Japan (Hokkaido) and China, respectively, protected by a deep cover of snow and under these conditions it does not matter that the temperature drops to well below 30C. But in Uppsala, both L. p. diversipilosum and R. russatum can suffer some damage during the winter if not protected, and the same applies to the hybrid between them. Rather surprisingly, the leaves are damaged more than the flower buds. Consequently, one can see abundantly flowering plants with most of the leaves brown and dead. When our crosses between ledum taxa and the Lapponica rhododendrons R. lapponicum and R. russatum were carried out reciprocally, they succeeded only when the ledum was the recipient of pollen. The length of the style is likely to decide whether or not a cross can be made reciprocally, since "...the pollen tube can not grow much longer than its own style length..." (27). The style of the ledum taxa is only 4-6 mm long, whereas the style of R. lapponicum and the style of R. russatum are 16 and 24 mm long, respectively. Hence, the pollen tube of the ledum taxa cannot grow far enough down the style of these Lapponica rhododendrons to reach the ovary and bring about fertilization, whereas the pollen tubes of R. lapponicum and R. russatum have no difficulty in reaching the ovary of the ledum taxa. When the style is shorter, however, as in R. ferrugineum (6-8 mm) and R. hippophaeoides (8 mm), crosses with ledum taxa can be made reciprocally. In this connection it could be worth mentioning that R. trichostomum , the seed parent of 'Arctic Tern', has a very short style. 3. The crosses from botanical and horticultural points of view. The fact that it is possible to cross ledum taxa with rhododendrons is no sensation today when Ledum has become a subsection in genus Rhododendron . It is however, somewhat surprising that the progeny of such a cross can be fertile, particularly when the parents are morphologically as different as R. russatum and L. p. diversipilosum . The hybrids between ledums and rhododendrons described here will certainly be followed by more. A prerequisite of success is probably that the attempts should involve lepidote rhododendrons. If the two taxa involved in the attempted cross have very different style length, it would be advisable to use the taxon with the shorter style as seed parent. To have a chance of obtaining a fertile hybrid, parents with the same chromosome number should be chosen, but that this is no guarantee for fertility is shown by x Ledodendron vanhoeffeni (15, 20). Unfortunately, the available information on the chromosome number of both ledums and rhododendrons is incomplete and partly unreliable. The question can be asked whether crosses between ledums and rhododendrons are of any interest except botanically. Like their ledum parents, many of the hybrids have a tendency to legginess and they are definitely not characterized by attractive foliage. On the other hand, like the ledums the hybrids are very floriferous and the flowers can be both interesting and beautiful. The pity is that their flowering season is so short. 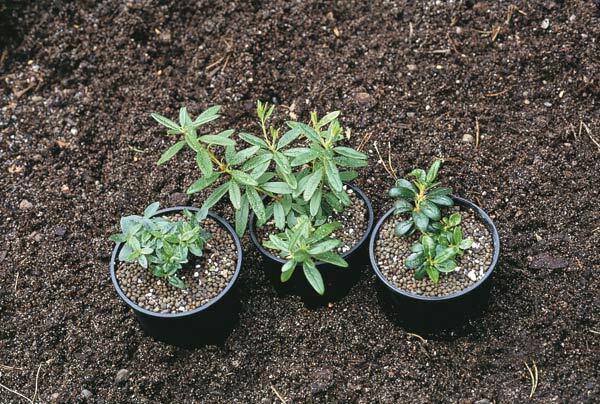 Hopefully, the hybrids will also inherit from their ledum parents a reasonable hardiness and ability to tolerate both drought and wet conditions. 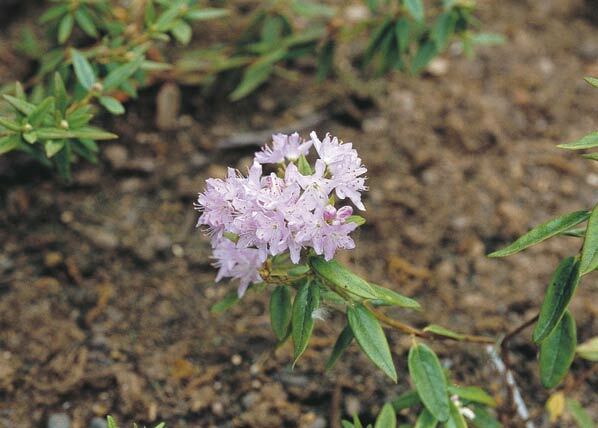 'Arctic Tern' is an example of a valuable garden plant resulting from a cross between a ledum and a rhododendron. 1. Abromeit, J. 1899. Botanische Ergebnisse der von der Gesellschaft fr Erdkunde zu Berlin unter Leitung Dr. v. Drygalski's ausgesandten Grnlandsexpedition nach Dr. Vanhffen's Sammlungen bearbeitet. B. Samenpflanzen (Phanerogamen) aus dem Umanaks-und Ritenbenks-Distrikt. Biblioth. Bot. 42(2):1.106. 2. Dalgaard, V. and B. Fredskild. 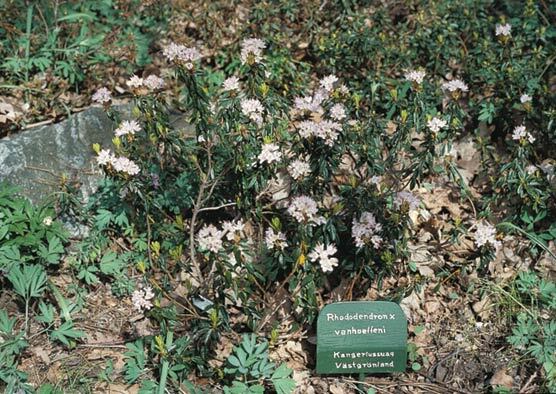 1993. x Ledodendron vanhoeffeni (syn. Rhododendron vanhoeffeni) refound in Greenland. Nord. J. Bot. 13:253-255. 3. Eiberg, H. 1999. Rhododendronfamiliens stamtrae. In "Rhododendron i Danmark i 25 ar" (Nielsen, B.L. and S. Munck-Hansen, eds): 186-199, Dragr, Rhododendronforeningen. 4. Gao, L.M., D.Z. Li, C.Q. Zhang and J.B. Yang. 2002. Infrageneric and Sectional Relationships in the Genus Rhododendron (Ericaceae) Inferred from ITS Sequence Data. Acta Bot. Sinica 44(11):1351-1356. 5. Hall, B. 2002: personal communication. 6. Hara, H. 1956. Contributions to the Study of Variations in the Japanese Plants closely related to those of Europe or North America. Part 2. J. Fac. Sci. Univ. Tokyo , III, vol. 6(7):351-352. 7. Harmaja, H. 1990. New names and nomenclatural combinations in Rhododendron (Ericaceae). Ann. Bot. Fennici 27:203-204. 8. Harmaja, H. 1991. Taxonomic notes on Rhododendron subsection Ledum (Ledum, Ericaceae), with a key to its species. Ann. Bot. Fennici 28:171-173. 9. Harmaja, H. 1999. Rhododendron diversipilosum, comb. nov . (Ericaceae). Ann. Bot. Fennici 35:263-264. 10. Harmaja, H. 2002. Rhododendron subulatum, comb. nova . (Ericaceae). Ann. Bot. Fennici 39:183-184. 11. Hultn, E. 1930. Flora of Kamtchatka and the adjacent islands, Part 4. Kungl. Sv. Vet. Akad. Handl. Ser. 3 , 8(2) p. 8-11. 12. Hultn, E. 1948. Flora of Alaska and Yukon . Part 8. p. 1221. C.W.K. Gleerup, Lund. 13. Hultn, E. 1968. Comments on the Flora of Alaska and Yukon. Arkiv Bot . 7(1): p. 93. 14. Hultn, E. and M. Fries. 1986. Atlas of North European Vascular Plants . II; map 1451, III:1103-1104. Knigstein, Germany: Koeltz Scientific Books. 15. Kihlman, B. 1993. Rhododendron vanhoeffeni Abrom. J. Amer. Rhod. Soc. 47(2):80-83. 16. Kirk, J.T.O. and R.A.E. Tilney-Bassett. 1978. The Plastids. Their chemistry, structure, growth and inheritance . Amsterdam, The Netherlands: Elsevier/ North Holland Biomedical Press. 17. Kron, K.A. and S.L. Johnson. 1998. Using DNA Sequences to Estimate Evolutionary Relationships Among Rhododendrons and Azaleas. J. Amer. Rhod. Soc . 52(2):70-72. 18. Kron, K.A. and W.S. Judd. 1990. Phylogenetic Relationships within the Rhodoreae (Ericaceae) with Specific Comments on the Placement of Ledum . Syst. Bot . 15:57-68. 19. Kurashige, Y., J.-I. Etoh, T. Handa, K. Takayanagi, and T. Yukawa. 2001. Sectional relationships in the genus Rhododendron (Ericaceae): evidence from matK and trnK intron sequences. Plant. Syst. Evol . 228:1-14. 20. Lantai, K. and B. Kihlman. 1995. The chromosome numbers of Ledum palustre ssp. decumbens and of some related taxa. Hereditas 122:181-184. 21. Paden, D.W. 1974. Rhododendron x Ledum groenlandicum: A Promising Innovation. Quart. Bull. Amer. Rhod. Soc . 28:222-223. 22. Porsild, A.E. 1951. Botany of southeastern Yukon adjacent to the Canol Road. Nat. Mus. Canada Bull . 121 p. 262. 23. Porsild, A.E. 1957. Illustrated Flora of the Canadian Arctic Archipelago. Nat. Mus. Canada Bull . 146 p.130. 24. Porsild, M.P., assisted by A.E. Porsild. 1920. The Flora of Disko Island and the Adjacent Coast of West Greenland. Medd. om Grnland 58:118-132. 25. v. Schantz, M. and R. Hiltunen. 1971. ber die Zusammensetzung des therischen les von Ledum palustre L. einschliesslich der geographischen Rassen ssp. groenlandicum (Oeder) Hult. und ssp. decumbens (Ait.) Hult. Scientia Pharmaceutica 39:137-146. 26. Small, E. and P.M. Catling. 2000. Poorly Known Economic Plants of Canada 26. Labrador Tea, Ledum palustre sensu lato (Rhododendron tomentosum ). Bull. Can. Bot. Assoc . 33:31-36. 27. Vinl, A. 1994. Breeding of Winter Hardy Deciduous Azaleas in Finland. J. Amer. Rhod. Soc . 48(2):94-96. 28. Wallace, G.D. 1992. Ledum in the New Jepson Manual and a New Combination for Ledum in Rhododendron (Ericaceae). Madroo 39(1) 77-78. Bengt Kihlman is a retired professor of cytogenetics.